So what is this science experiments package the Apollo astronauts left behind, this ALSEP? What did it do? ALSEP was a collection of geophysical instruments designed to continue to monitor the environment of each Apollo landing site for a period of at least a year after the astronauts had departed. Most of what we have learned about the Moons interior is from the ALSEP data. Designed for a life of one year (Apollo 17 was for two), they ended up working for up to 8 years, the experiments permanently shut down by Mission Control on 30 September 1977. Due to the experimental nature of the first landing of Apollo 11, especially the mechanics of getting to the lunar surface and back, science took a lesser role, so Apollo 11 had a simpler version known as the Early Apollo Surface Experiments Package (EASEP), with only two experiments. 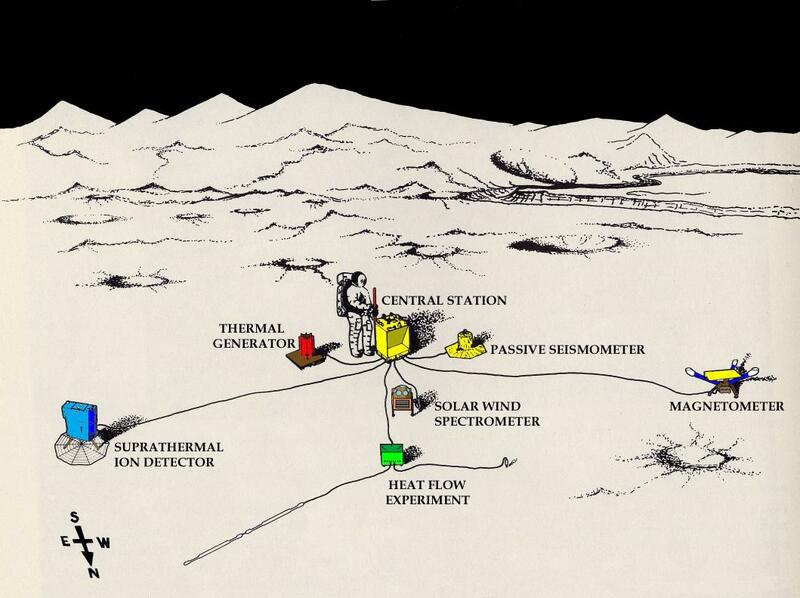 Once the ALSEPs were established on the Moon, tracking was shared around the MSFN, (from 1972 STDN) stations. At Honeysuckle Creek we tracked the ALSEPs regularly between the various missions, particularly during Skylab, until we went to the Deep Space Network in 1974. It was very monotonous for us, as it was only tracking the Moon and collecting and recording a steady stream of data of 9 million measurements per ALSEP per day. With 5 ALSEPs this swamped the scientists with 45 million measurements per day! At the station we could pick off signals and watch for events. I remember Laurie Turner calling me over one day to look at sunrise on a Beckman pen recorder he had set up. I watched the trace wriggle quite violently as the Suns rays struck the lunar surface and the soil expanded with the heat (you could almost imagine it crackling! ), gradually dying away as the soils temperature stabilised. 10th September 1970. Scan by Hamish Lindsay. Do you remember how the ALSEP receiver sensitivities were too high and they used to react to the radio noise and apply random commands occasionally? The monkeys and Shakespeare effect. I believe they thought it was the Russians in the early days! Eventually some of the controllers used to let us send some of the correcting commands – otherwise they would have to drive in – they were on call out I think towards the end. 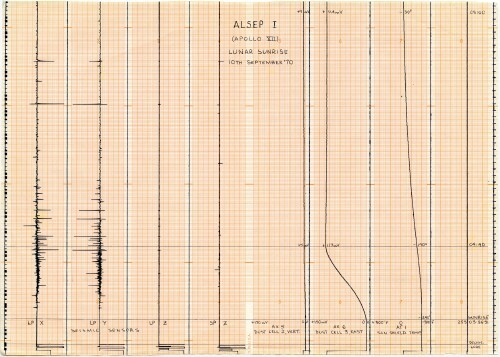 Also it was great to watch some of the ALSEP parameters on the strip chart recorders in the TLM area. A favourite was the seismic data. One track we saw a bunch of weird sine wave 'pings' superimposed on the data, and so I asked the controller what might be causing them. He replied, “That’s the lunar sunrise heating up the Mylar heat shield blanket - it’s pinging like a cookie tin lid”. I really enjoyed that sort of visibility, and the ALSEPs – they each had their own characters :-) – even though we might not have always known what we were seeing. Ed von Renouard preserved this plot of the same event (10th September 1970), showing the full width of the eight channels plotted. Note the Sun Shield temperature second strip from the right. The ALSEP program began on 31 March 1963 with a series of meetings between NASA Headquarters, the Jet Propulsion Laboratory (JPL), and the Goddard Space Flight Center (GSFC). The first choice of experiments was proposed in December 1963, and consideration was given to those experiments that promised maximum return for least weight and complexity. Suggested experiments were active and passive seismic devices, instruments to measure the surface bearing strength, magnetic field, radiation spectrum, soil density, and gravitational field. What is the internal structure of the Moon? What is the actual geometric shape of the Moon? What is the present internal energy regime of the Moon? What is the composition of the lunar surface? What principal processes were responsible for the present structure of the Moon? What is the present tectonic pattern and distribution of tectonic activity on the Moon? What are the dominant processes of erosion, transport, and deposition of material on the lunar surface? What volatile substances are present on or near the lunar surface? Are there organic and/or proto-organic molecules on the Moon? What is the age of the Moon? What is the history of dynamic interaction between the Earth and the Moon? From the list of questions from the Woods Hole meeting, it was decided it was possible to design a complete lunar geophysical station, which would give this information. It could be housed in a storage bay of the LM and be deployed on the surface of the Moon by the astronauts. By 7 June 1965 Dr George Mueller, the Associate Administrator for Manned Space Flight, authorised a budget for ALSEP, and responsibility of the management was assigned to the Manned Spacecraft Centers Experiments Program Office. With a budget now available, the MSC Office had prototypes built by three firms: Bendix Systems Division, TRW Systems Group, and Space-General Corporation, each given a $500,000, six month contract. The MSC Office would select one of the three to develop the final ALSEP flight hardware. Passive Lunar Seismic Experiment, Massachusetts Institute of Technology, Frank Press; Columbia University, George Sutton. Lunar Tri-axis Magnetometer, Ames Research Center, C. P. Sonett; MSC, Jerry Modisette. Medium-Energy Solar Wind, Jet Propulsion Laboratory (JPL), C. W. Snyder; JPL, M. M. Neugebauer. Suprathermal Ion Detection, Rice University, J. W. Freeman, Jr.; MSC, F. C. Michel. Lunar Heat Flow Management, Columbia University, M. Langseth; Yale University, S. Clark. Low-Energy Solar Wind, Rice University, B. J. OBrien. Active Lunar Seismic Experiment, Stanford University, R. L. Kovach; U.S. Geological Survey, J. S. Watkins. On 16 March 1966 NASA Administrator James E. Webb and Deputy Administrator Robert C. Seamans, selected Bendix Systems Division, Bendix Corporation, to design, manufacture, test, and provide operational support of the ALSEP packages, with the first delivery scheduled for July 1967. The contract was approved by NASA on 5 November 1966. The estimated cost of the cost-plus-incentive-fee contract negotiated with Bendix before the presentation by the Source Evaluation Board to Webb and Seamans, was $17.3 million. Due to Apollo 11 being more of a test flight than a scientific mission, a simplified package was chosen. The Early Apollo Surface Experiments Package (EASEP) was approved to be supplied by Bendix, on 5 November 1966 for Apollo 11. The EASEP station, located at 0.6735°N latitude 23.4730°E longtitude, was turned on at 1440 AEST 21 July 1969 and failed on 27 August 1969, 31 days beyond its designed lifetime. Edwin Aldrin deploys the EASEP during the Apollo 11 EVA. 1. Passive Seismic Experiment Package (PSEP). This instrument contained four seismometers powered by two panels of solar cells, which converted solar energy into electricity. It used three long-period seismometers and one short-period vertical seismometer for measuring meteorite impacts and moonquakes, recording about 100 to 200 hits by meteorites during its lifetime. Data regarding the strength, duration, and approximate direction of the seismic event were relayed to tracking stations on Earth. The Apollo 11 Passive Seismometer station shortly after its deployment by Buzz Aldrin. Because it was only powered by solar cells, the experiment only operated during the lunar days. During the 340 hour lunar night, when temperatures can plummet to minus 170°C the instrument was kept to a minimum of minus 54°C by a radioisotope heater, the first major use of nuclear energy in a NASA manned mission. Any temperature below this could damage the instrument. At the other end of the scale the scientists tried controlling the daytime heat on the electronic components by a series of power dumps, cutting off the systems electrical power. Then, just before the lunar night began, the seismometer automatically shifted into stand-by mode, stopping transmission of all data. 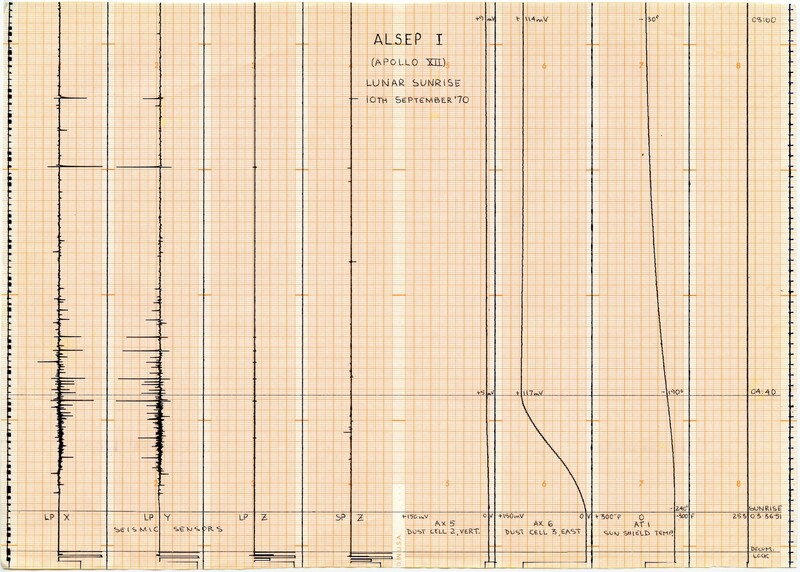 The seismic instrument package stopped responding to commands at 1400 AEST 25 August 1969. 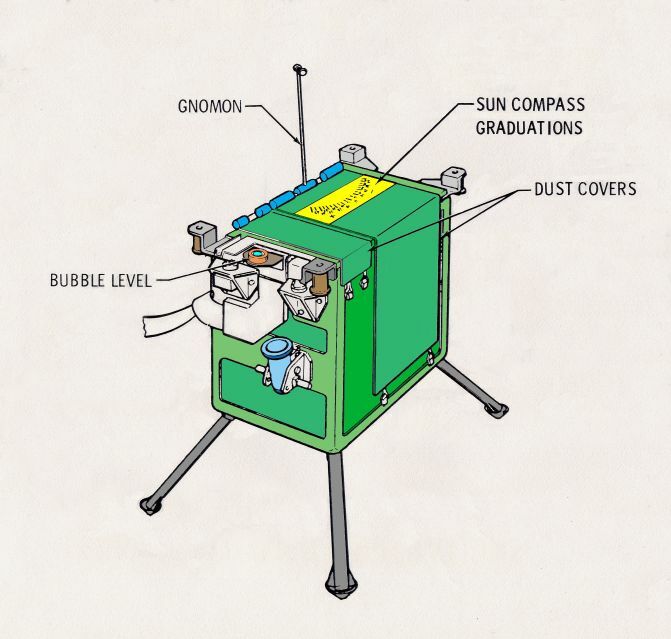 The Apollo 11 EASEP Passive Seismometer Experiment Package. Bendix Aerospace Systems Division, 1969. 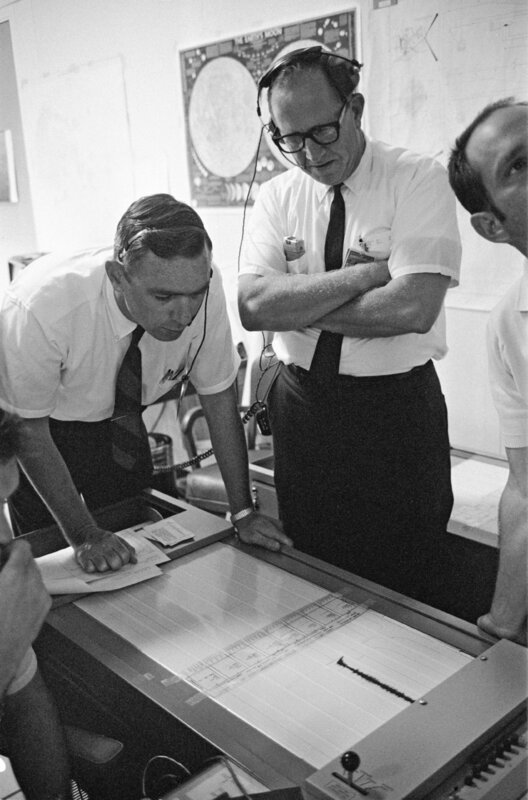 Dr. Garry Latham (on left), with the Lamont Geological Observatory, studies seismometer tracings in the Mission Control Centers ALSEP control room. 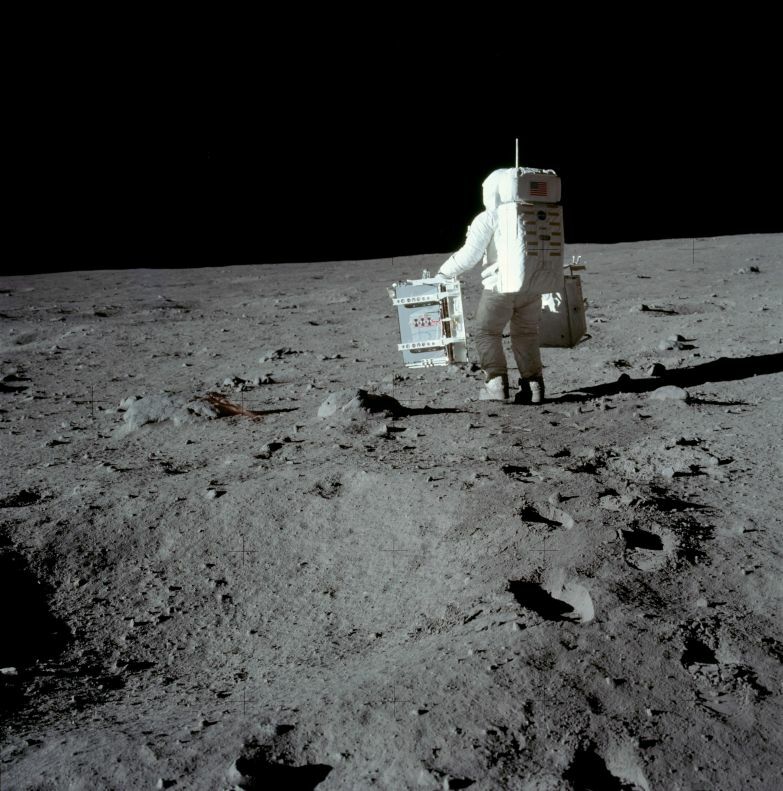 The electronic data was transmitted from the Passive Seismic Experiments Package which the Apollo 11 astronauts had just deployed on the surface of the moon. 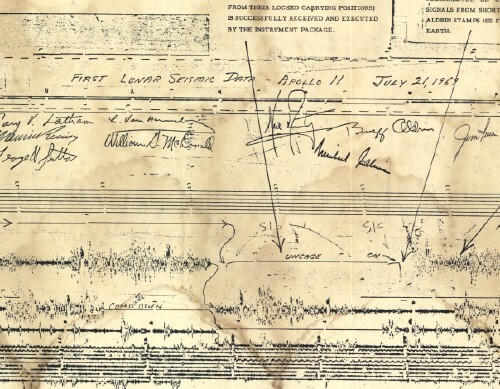 This scan of a copy of the first lunar seismogram – complete with signatures of the Apollo 11 crew, Dr Garry Latham, and other members of his team – is courtesy of Trevor Dalziell at Geoscience Australia. It seems that this copy (now water damaged) was a part of the US display at Expo 88 in Brisbane. Apollo 15 astronaut Jim Irwin’s signature was added at the Expo. Somehow it made its way to the Geoscience Australia field station in Charters Towers, until it was transferred to Canberra in late 2011. Thanks also to Bruce Stewart for first mentioning this plot. Click the image to see the full plot with annotations. 2. 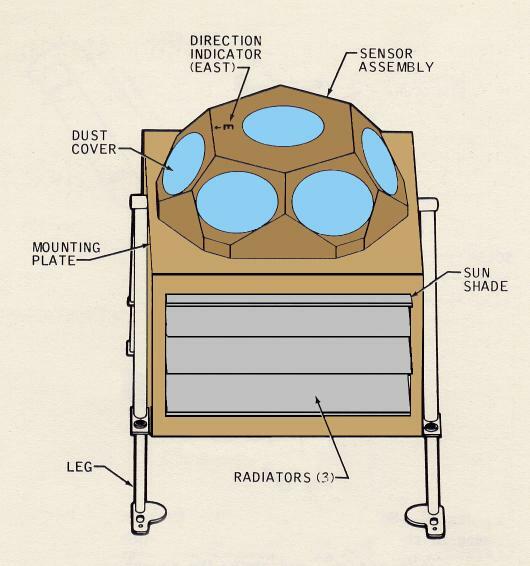 Lunar Dust Detector (LDD). This experiment measured the amount of dust accumulating on the lunar surface. 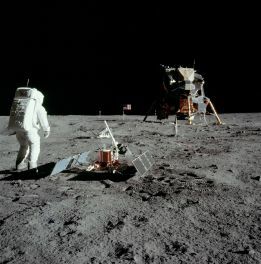 It also measured the damage to solar cells by high-energy radiation as well as the reflected infrared energy and temperatures of the lunar surface. It consisted of three photocells mounted on the EASEP. This passive experiment consisted of an array of 100 fused silica cubes, arranged to reflect a beam of light back on a parallel path to its origin. The LRRR placed on the Moon was aligned precisely so that it faced the Earth. Scientists from around the world directed laser beams at the instrument which reflected them back to Earth; the elapsed time for the round trip allowed precise measurements of distances, down to an accuracy of 8 centimetres, between the Earth and the Moon. The Apollo 11 Lunar Ranging Retro-Reflector, shortly after being deployed. The very first lunar laser ranging observations of the Apollo 11 retro-reflector package were made with the 3.1-metre telescope at Lick Observatory. However, the ranging system at Lick was designed solely for quick acquisition and confirmation, rather than for an extended program. After a further two LRRRs were deployed in the Apollo 14 and 15 missions, and as other institutions around the world picked up the experiment, the data began to extend our knowledge about the solar system, particularly the Earth/Moon relationship. Before the Apollo 11 LRRR, only rough measurements could be made. Although the moon is on average about 383,000 kilometres away from Earth, using the LRRRs scientists are able to measure the Earth-moon distance to an accuracy of about 8 centimetres. The reflector array allowed scientists to precisely measure the moons orbit, spin rate and recession. Measurements from the LRRRs show that the Moon is receding from Earth at a rate of about 3.8 centimetres per year. The measurements also allowed scientists to measure all kinds of parameters about the moon, from the thickness of its crust to the makeup of its iron core, to the motion of its axial wobble and warping of the lunar surface. Results also proved that the ocean tides on Earth have a direct influence on the Moons orbit. Carroll Alley, a University of Maryland physicist who was principal investigator for the reflector experiment said there seems to be no measurable degradation in their performance, though there were predictions that lunar dust, particularly from the LM ascent, would degrade the reflectors. These reflectors are the only experiments left behind by the Apollo astronauts that remain operational into the 21st century. The Solar Wind Composition Experiment (SWC). The Solar Wind Composition Experiment on the Lunar surface during the Apollo 11 EVA. Neil Armstrong is moving out of frame at left. The Solar Wind Composition Experiment (SWC), an aluminium foil panel, similar to household foil, that collected atomic particles released by the Sun into space, was provided by scientists from Switzerland. It was deployed and exposed for 1 hour 17 minutes and returned to Earth by the Apollo 11 crew for analysis. After the mission, scientists in Switzerland analysed the exposed foil. THE ALSEP SYSTEM AND EXPERIMENTS. The ALSEP system, first flown on the Apollo 12 mission, consisted of a Central Station with a nuclear power pack and a communications centre with leads running out to the instruments placed around it. DC power of 70 watts at 16 volts was supplied by SNAP-27 model radioisotope thermo-electric generators (RTG), placed beside the station and connected by cables. The generator was filled with a radio-active plutonium fuel after the astronauts placed it on the lunar surface. The nuclear fuel was carried to the Moon in a cask mounted on the side of the LM, removed, and inserted in the generator by the astronauts. The power required by the whole station and experiments was less than the power of a 75 watt light bulb. ALSEP configuration for Apollo 15. 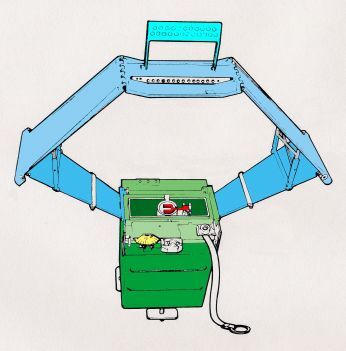 The station and instruments had to be carried to a distance of at least 90 metres from the LM, and was planned to take a maximum of 120 minutes to deploy, power up and initiate the experiments. The instruments were arrayed around the central station, which supplied power to run the instruments and provided two-way communications so data collected by the experiments could be relayed to Earth and commands could be received. The central station was a 25 kilogram box with thermal control achieved by passive elements (insulation, reflectors, thermal coatings) as well as power dissipation resistors and heaters. Communications with Earth was with transmitters, receivers, data processors and multiplexers housed within the central station, with signals transmitted through a 58 centimetre by 3.8 centimetre modified axial-helical antenna mounted on top, and pointed towards Earth by the astronauts. Data collected from the instruments was converted into a telemetry format and transmitted to Earth. 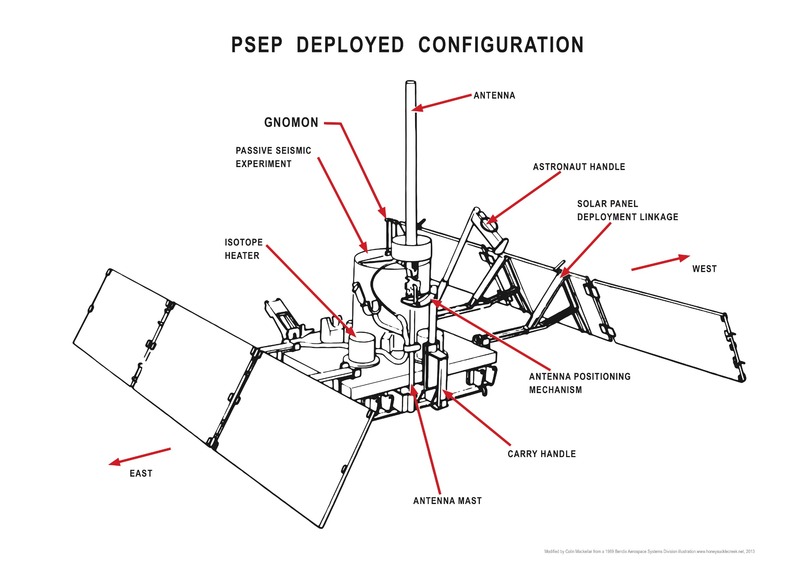 The ALSEP systems and instruments were controlled by commands from Earth, sent through the tracking stations. The uplink frequency for all Apollo ALSEPs was 2119.0 MHz. 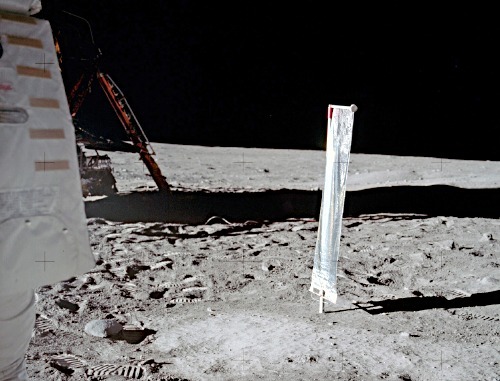 An unexpected problem with the first ALSEP on Apollo 12 involved the cables, which connected the various units to the Central Station. Although the cables were fairly stiff, on Earth they tended to lie flat to the ground, held down by their own weight. However, on the Moon, the cables hardly seemed to notice the one sixth gravity and retained loops and bends they had acquired during storage inside the LM  loops that stood up from the ground rather like sections of a frozen garden hose. 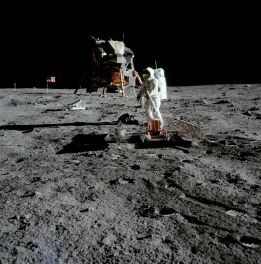 There were no disastrous tripping episodes during Apollo 12 such as occurred on Apollo 16, but the need to dodge cable loops slowed the astronauts work. Apollo 12, 14, 15, 16. To determine sub-surface properties and measure extremely small vibrations of the lunar surface caused by distant moonquakes and man-made explosions and spacecraft impacts. 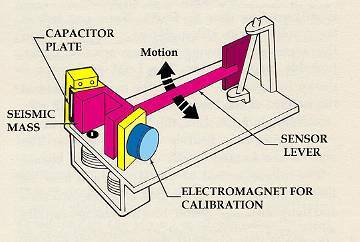 As the instrument vibrates from crustal movement, the inertia of the central lever and the mass on the end caused it to vibrate in sympathy, which was detected electronically by the capacitor effect of the mass on the end of the lever. An internal set of motors kept the seismometers constantly level within a few seconds of arc. Seismic motions were recorded on Earth with a magnification factor of 10 million. The network of four ALSEPs that had the instrument enabled the seismologists to locate moonquakes in three dimensions, and to study the seismic velocities and propagation characteristics of the lunar subsurface materials. The ALSEPs measured daily meteorite impacts and an average of two moonquakes per month, up to depths of 800 kilometres. Earthquakes on the Earth exceed one million per year. On the Moon, there may be up to 300. And they are much smaller than the ones on Earth. It was noted that there was increased activity when the Moon was farthest from, and nearest to, the Earth. As I have already mentioned above, the heat from sunrise on the Moons surface used to be recorded by ALSEP each lunar day. Ed von Renouard preserved this plot of a seismic event on April 27 1971 – as sent from ALSEP 1, left by Apollo 12. The Passive Seismic Experiment studied the propagation of seismic waves through the Moon and provided our most detailed look at the Moons internal structure. 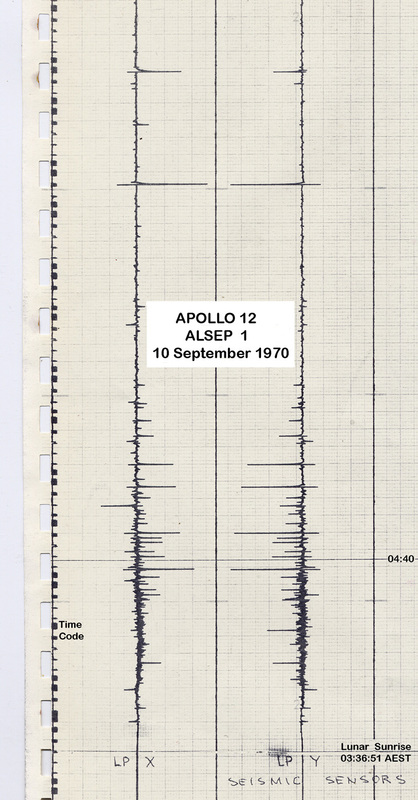 The Apollo 11 seismometer returned data for just three weeks but provided a useful first look at lunar seismology. More advanced seismometers were deployed at the Apollo 12, 14, 15, and 16 landing sites and transmitted data to Earth until September 1977. Each of these seismometers measured all three components of ground displacement (up-down, north-south, and east-west). If a seismic event is observed by three or more seismometers separated by distance, the time and location of the event can be determined. Because seismic waves from distant events travel deeper into the Moon than waves from nearby events, by measuring events at various distances from the seismometer, one can determine how seismic velocities vary with depth in the Moon. In turn, this information can be used to study the Moons internal structure. Most of the events observed by the seismometers were due either to moonquakes or to meteoroid impacts. However, the third stages of several Saturn V rockets and the ascent stages of several lunar modules were deliberately crashed onto the Moon after they were discarded. These man-made crashes produced seismic events of known times and locations and helped to calibrate the network of seismometers. Knowledge of Lunar Interior Structure. Like the Earth, the Moon has a crust, mantle, and core. The lunar crust is rich in the mineral plagioclase and has an average crustal thickness of 6070 kilometres, which is about 3 times the average crustal thickness on Earth. The lunar mantle lies between the crust and the core and consists mostly of the minerals olivine and pyroxene. The core is probably composed mostly of iron and sulphur and extends from the centre of the Moon out to a radius of no more than 450 kilometres, i.e., the core radius is less than 25% of the Moons radius, which is quite small. In comparison, the Earths core radius is 54% of the Earths radius. However, the size of the lunar core is not well constrained by existing seismic observations. Better constraints came from the laser ranging retro-reflector and magnetometer experiments. Distribution of Lunar Seismic Sources. More than 1,700 meteoroid impacts were recorded by the seismometer network, with impactor masses estimated to be between 0.5 and 5000 kilograms. Most moonquakes occur at depths of 800 to 1000 kilometres. These occur at monthly intervals at about 100 distinct sites, indicating that these moonquakes are caused by stresses from changes in lunar tides as the Moon orbits the Earth. These moonquakes are quite small, mostly with Richter scale magnitudes less than 2. The amount of energy released by earthquakes in a typical year is about 10 million times larger than that released by moonquakes in a year. Only a few near-surface moonquakes were detected. Attenuation of Seismic Waves. Meteoroid impacts cause heavy fracturing in the upper 20 kilometres of the lunar crust. These fractures in turn cause scattering of seismic waves in these regions. Below 20 kilometres, seismic wave scattering decreases as a result of either closure of these fractures due to increasing pressure or of a change in chemical composition of the crust. In the mantle, seismic waves are attenuated much less on the Moon than they are on Earth. Seismic wave attenuation is enhanced at high temperatures and in the presence of water, and the low attenuation on the Moon indicates a cold, dry interior. Because the Moon is smaller than Earth, it is expected to have cooled more rapidly, producing a cold interior. The apparent absence of water may be due either to the failure of the Moon to accumulate water when it formed or to subsequent loss of water to space. Below 1000 kilometres depth, seismic wave attenuation increases, possibly indicating the presence of a small amount of molten rock. Scientists hoped that moonquakes and meteorite hits would answer the questions; does the Moon have a molten core and what is the deep interior of the Moon like? To answer these questions they needed at least one large impact event of at least 1019 ergs on the back of the Moon. On 13 May 1972 a front side event with an energy of 1,100 kilograms was recorded. On 19 September 1973 a large back side event with an energy of 10^18 ergs took place. 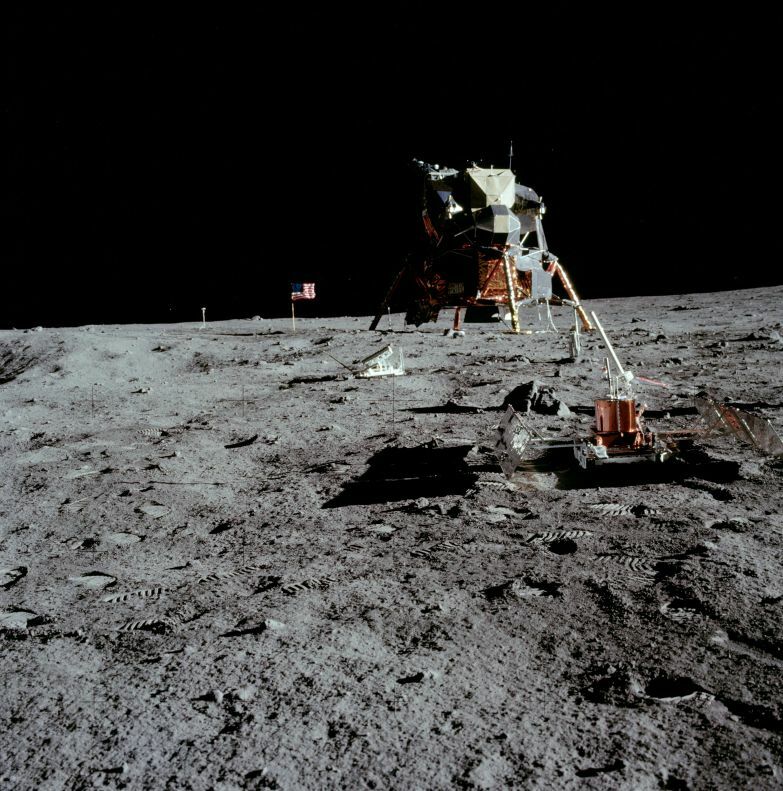 On 17 July 1972 only three months after it was set up, Apollo 16s seismometer registered the largest impact ever recorded on the moon when a meteorite hit the far side of the moon near Mare Moscoviense, located at 26°N 147° E.
Over the 8 years of the ALSEPs lives, around 10,000 moonquakes and 2,000 meteorite impacts were registered by the seismometers. The seismic information, magnetometer, and heat flow experiments contributed the principal information about the Moons interior. It is now believed the Moons crust is multi-layered and from 60 to 100 kilometres thick, with a secondary boundary occurring about 20 kilometres under the surface. The upper mantle has been determined to consist of olivine or olivine-pyroxene matter, and to be quite homogeneous, extending about 500 kilometres down. Below this level the seismic data infers the interior is iron-enriched, although there is insufficient data to determine if the Moon has a molten core. Moonquakes were discovered to show periodicity and recur at several places in the interior. The time cycle of the deep focus moonquakes follows the tidal cycles so closely it appears likely that tidal forces are a major factor in triggering deep focus moonquakes. The Moon rings like a bell when struck by a large object. The first man-made crash directed at the Moon that could be detected by a seismometer occurred after the Apollo 12 astronauts had returned to the CSM and the LM ascent stage was sent smashing into the Moons surface. The shock waves of this impact surprised the scientists  the Moon vibrated for over 55 minutes!! Also, the kinds of signals recorded by the seismometers were utterly different from any ever received before, starting with small waves, gaining in size to a peak, and then lasting for incredibly long periods of time. A seismic wave took 7 to 8 minutes to reach the peak of impact energy and then gradually decreased in amplitude over a period that lasted almost an hour. It was claimed that even after an hour the minutest reverberations had still not stopped. When the Apollo 12 LM hit the lunar surface at 6,048 kilometres per hour, 72 kilometres from the landing site, digging an estimated 9 metre wide crater, the results were astonishing. All 3 seismometers in the package recorded the impact, which set up a sequence of reverberations lasting nearly an hour. Nothing like this had ever been measured on Earth. The LM impact occurred at 1617 USCST 20 November (0817 AEST 21 November) 1969. A news conference had been scheduled to begin at 1630, and when it did start, the Moon was still ringing as the scientists  all of them seismic experts  arrived at the news centre from their laboratories. Maurice Ewing, co-head of the seismic experiment, told the afternoon news crowd of the unexpected event, informing them that the Moon was still ringing. He confessed he was at a loss to explain why the Moon behaved so strangely. As for the meaning of it, Ewing announced, Id rather not make an interpretation right now. But it is as though one had struck a bell, say, in the belfry of a church a single blow and found that the reverberation from it continued for 30 minutes. As he spoke the reverberations continued on for another 25 minutes. 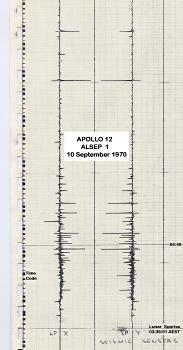 The seismometer trace displaying the Apollo 12 Lunar Module impact. The Active Seismic Experiment was complementary to the Passive Seismic Experiment in two ways, scale and source of energy. The Passive Experiment was designed to study the whole Moon; the Active Experiment to study the local area. Rather than wait passively for natural events to occur on the Moon to produce shock waves, the Active Experiment provided its own sources. The shock waves are produced by explosions on the lunar surface. Two different kinds are used, small ones made while the astronauts are on the surface and large ones after they left the site and returned to the Earth. The different kinds of sources for the Active Experiment were a thumper and a mortar. The thumper was used by the astronaut to explode shotgun-like charges. The thumper contained 19 such charges. It was fired at evenly spaced intervals along the geophone line. 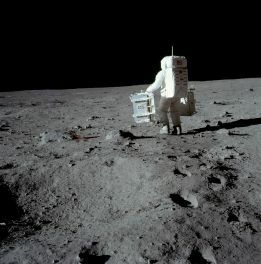 The results from this part of the experiment were available while the astronauts were still on the surface of the Moon. The second kind of charge was similar to that of a mortar. In fact, the unit that fired these charges was referred to as a mortar package assembly. It contained four grenades that were launched using self-contained rockets sometime after the astronauts had left the Moon. The astronauts aligned the mortar launcher and armed it for firing. This unit contained geophones for measuring the velocity of each grenade on launch and the exact time of launch. Each grenade contained a rocket motor, a high explosive charge, provisions for igniting the rocket and a device to detonate the charge, a battery, a transmitter that provided information as to the length of time of the flight and the moment of impact on the Moon, and a thread with which to measure the distance of the impact from the launcher. Because there is no atmosphere on the Moon, the thin thread trailing the grenade remained taut and measured accurately the horizontal distance from the point of launch to the point of impact. They had been designed to impact the Moon at distances of 137, 282, 853, 1372 metres from the launcher. The size of the explosive charge increased with distance. Any layering in the Moon that is present in the first 300 metres beneath the surface would be seen with the Active Experiment. 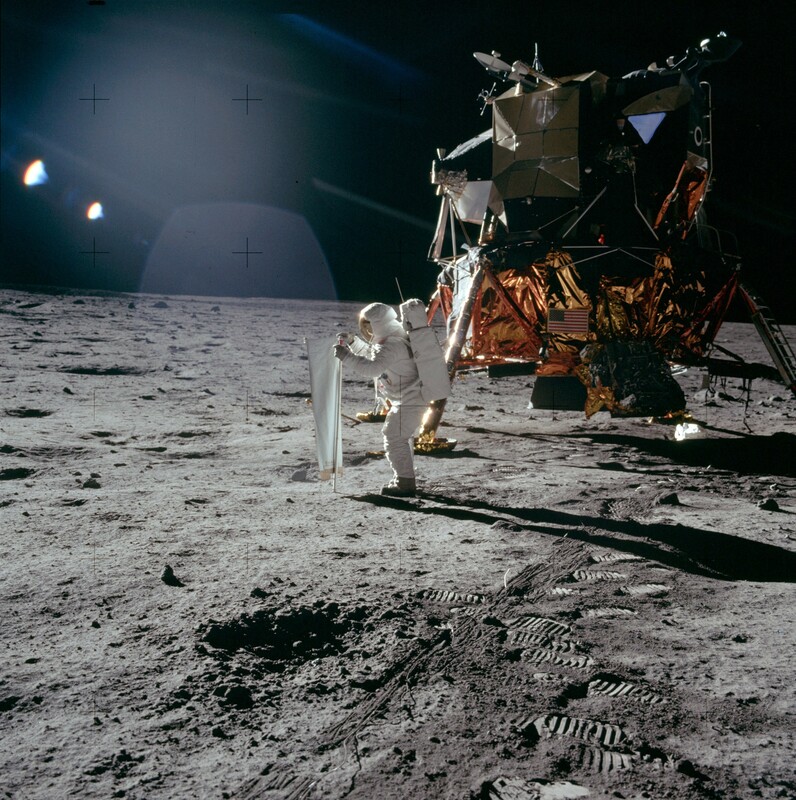 Two experiments, the Active Seismic Experiment on Apollo 14 and 16 and the Lunar Seismic Profiling Experiment on Apollo 17, were performed to determine the detailed structure of the upper kilometre of the lunar crust. Both experiments involved detonation of a series of small explosives. 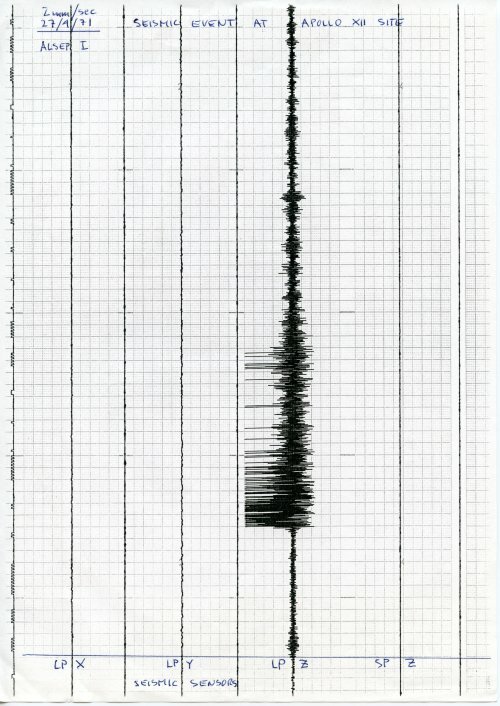 The seismic waves, or ground vibrations, caused by these explosions were measured by a network of geophones (a kind of electronic stethoscope). On Apollo 14 and 16, up to 19 explosions were detonated by an astronaut using a device called a thumper along a 90-metre-long geophone line. On Apollo 16, three mortar shells were also used to lob explosive charges to distances of up to 1,300 meters from the ALSEP. Both the Apollo 16 mortar shells and the Apollo 17 explosives were detonated by radio control after the astronauts left the lunar surface. These experiments showed that the lunar seismic velocity is between 0.1 and 0.3 kilometres per second in the upper few hundred metres of the crust at all three landing sites, which agrees closely with the passive data. These velocities are much lower than observed for intact rock on Earth, but are consistent with a highly fractured or brecciated material produced by the prolonged meteoritic bombardment of the Moon. 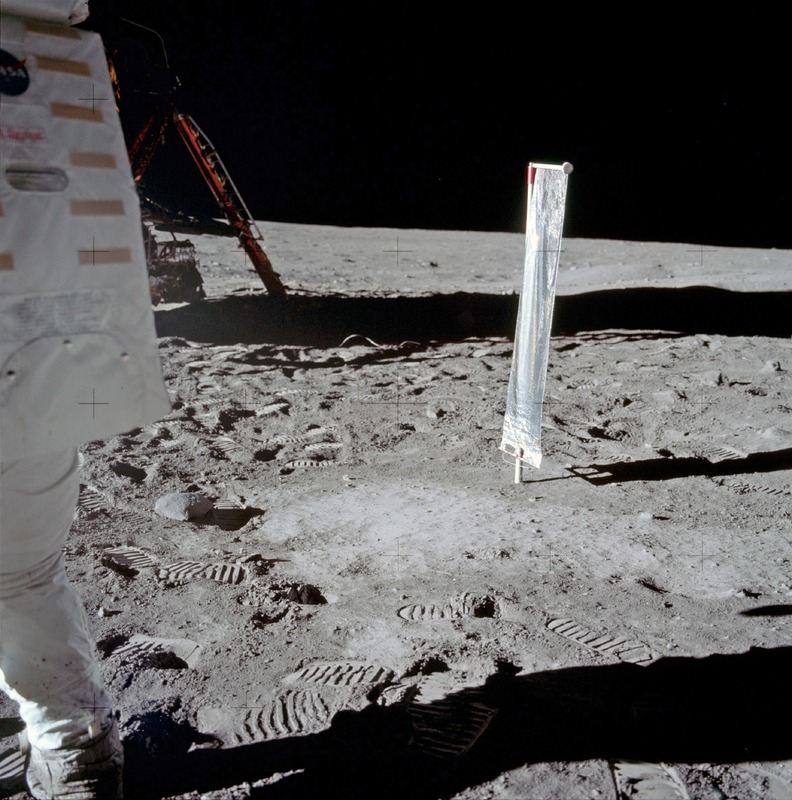 At the Apollo 14 site there was a regolith surface layer of 8.5 metres. At the Apollo 17 landing site, the surface basalt layer was determined to have a thickness of 1.4 kilometres, slightly higher than the 1 kilometre thickness determined from the Traverse Gravimeter Experiment. Heat flows from hot regions to cooler regions. The interior of the Moon is warm compared to the surface, therefore heat flows from the interior to the surface where it is lost into space by radiation. This heat is mainly produced by the decay of natural radioactive elements thorium, uranium, and potassium, raising the heat of the interior of the Moon. The Heat Flow experiment was designed to measure the heat loss from the interior of the Moon. Two holes were drilled into the lurain to a depth of 3 metres and platinum resistance thermometers were placed at several points in the lower part of the holes and several thermocouples were placed in the upper parts of the holes. 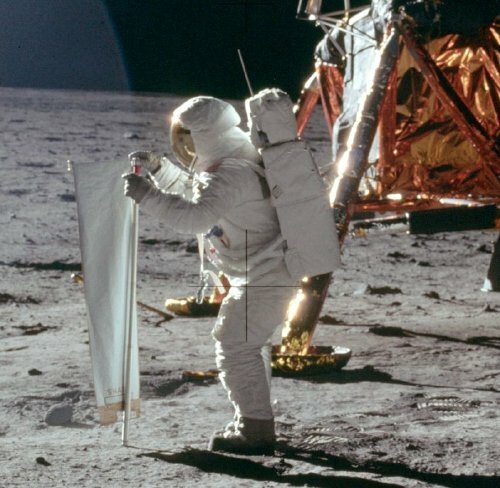 The importance of the Heat Flow Experiment was used to set the limits on the amount of radioactivity of the Moon, and to set limits on models of the thermal history of the Moon. The rate at which a planet loses its internal heat to space is an important control on the level of tectonism (faulting and folding of the planets surface due to internal deformation) and volcanic activity on the planet. This loss of internal heat was measured by the Heat Flow Experiments on Apollo 15 and 17. This experiment was also attempted on Apollo 16, but failed due to a broken cable connection. The HFE involved drilling two holes into the regolith to depths of 1.6 to 2.3 metres. The temperature was measured at several depths within the hole. The rate at which temperature increases with depth is a measure of the heat flowing from the Moons interior. The drilling caused some heating within the hole, although the effects of this heating decayed with time. Also, temperatures in the upper part of the regolith vary as the amount of incident sunlight changes throughout the lunar day and night. By monitoring temperatures in the drill holes over a long period of time, these effects can be accounted for, allowing a determination of the average heat flow rate at the landing site. 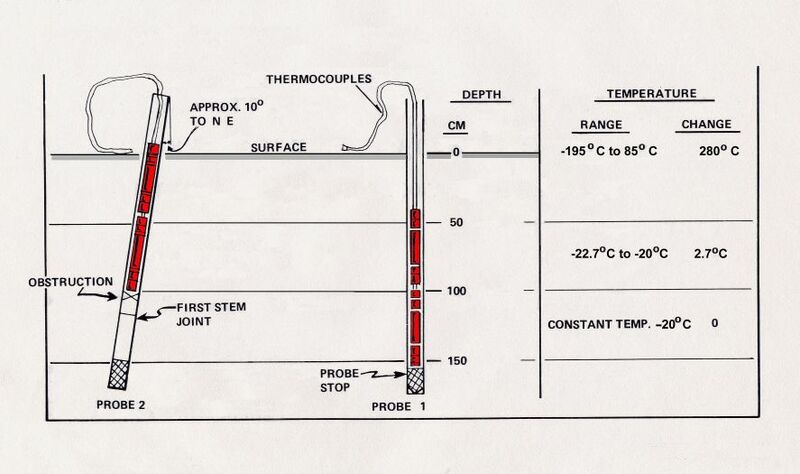 The Apollo 15 Heat Flow core and probe situation. The HFE found that the surface layer temperature during the night was 76K (-197°C) rising to a maximum of 358K (+85°C) during the day. The temperature at 1.5 metres under the surface was a constant 253K (-20°C), indicating the regolith is an excellent thermal insulator. The results of these measurements indicate a heat flow of 21 milliwatts per square metre at the Apollo 15 landing site and of 16 milliwatts per square metre at the Apollo 17 landing site. The Earths average heat flux is 87 milliwatts per square metre. The small value of the lunar heat flow was expected, given the Moons small size and the observation that it has been nearly dead volcanically for the last 3 billion years. Because the heat flow was measured at only two locations, it is not known how representative these values are for the Moon as a whole. However, because both measurements were obtained near boundaries between mare and highland regions, it is thought that the measured heat flows are probably 1020% higher than the average value for the entire Moon. with a resolution of 0.2 nT. The ALSEP Lunar Surface Magnetometer. Magnetic fields of the Earth and Moon have two parts; one that changes with time, and one that is steady. The part that changes with time is caused by travelling electromagnetic waves. The steady part of the Earths magnetic field, which affects the common compass, varies from 35,000nT at the equator to 60,000nT at the poles, whereas the lunar magnetic field is only about 6 to 100 nT gamma, most likely due to the presence of natural magnetism in lunar rocks inherited early in the Moons history, when the magnetic field was much stronger that it is today. The Lunar Orbiters data inferred there was a steady magnetic field of about 8 nT. The magnetometer also measured the variation in time of the magnetic field, caused by electromagnetic waves propagated from the Sun. The moon has no global magnetic field like the Earth because it no longer has an internal dynamo, so it was a surprise when magnetometers placed by Apollo astronauts on the surface detected a faint magnetic field, as large as hundreds of nanoteslas. When the scientists built an electron detector that flew aboard Apollo 15 in 1971 and Apollo 16 in 1972, they quickly realised they could use the instrument to remotely map the magnetic fields on the surface. Though crude and covering only about 10 percent of the lunar surface, the measurements nevertheless indicated a correlation between meteor impact basins  dark, roughly circular features on the face of the moon and strong magnetic fields on the diametrically opposite side of the moon. 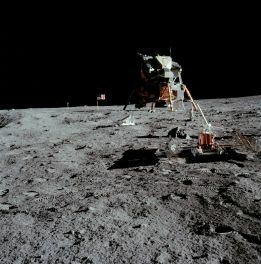 Theorists came up with an explanation for magnetic fields antipodal to impact basins not long after the Apollo measurements hinted at a correlation. When a large meteor hits the moon, it and much of the lunar surface is vaporized and thrown into space, forming a cloud of debris and gas larger than the moon itself. Because of the heat released in the collision, much of the gas is ionised plasma in which the atoms are stripped of one or more electrons. Such plasmas exclude magnetic fields, so as the cloud spread around the moon it pushed the moons magnetic field in front of it. When the plasma cloud finally converged on the diametrically opposite side of the moon  a mere five minutes after impact  the squeezed magnetic field would be quite large. At the same time debris was falling back on the lunar surface, concentrated at the antipodal site also. If this debris dropped onto the surface during the time when the magnetic field was high, it could have undergone shock magnetization. When rock is shocked, as when hit with a hammer, it can suddenly lose its own magnetic field and acquire that of the surrounding region. Scientists think that the magnetism of the Moons surface is left over from a time when the Moons magnetic field was actively created by a dynamo within the lunar core, and that this remnant magnetism may gradually erode away. Theories also suggest that the Moons magnetism may come from collisions with other celestial bodies such as asteroids and comets, which might have imparted to the Moon some magnetic properties. The LSM measured a steady 38 nT at the Apollo 12 site, and 6 nT at the Apollo 15 site. This experiment measured the amount of dust accumulating on the lunar surface, which translated into the solar illumination detected by the cells. 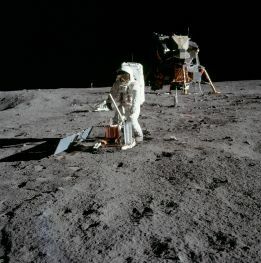 It also measured the damage to solar cells by high-energy radiation as well as the reflected infrared energy and temperatures of the lunar surface. It consisted of three photocells mounted on the Central Station. 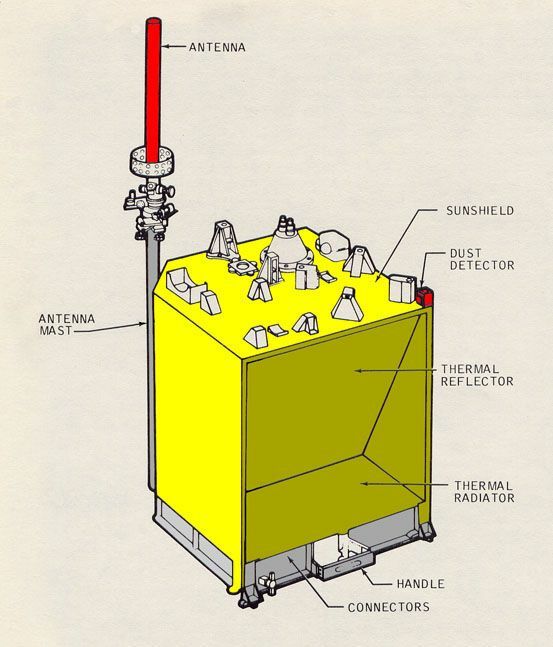 Prior to the Apollo landings, it was thought that there would be a heavy dust layer deposited on the ALSEP experiment package during LM ascent and possibly from other long-term sources. This experiment was designed to measure this dust layer deposition and was performed on Apollo 11, 12, 14, and 15 missions. It was housed in the ALSEP central station and measured the power output and temperature of the three solar cells. The dust accumulation proved to be much lower than expected, and the results from this experiment were also used to monitor the long-term degradation of solar cells from radiation and thermal effects. This was considered to be an engineering rather than a scientific experiment. 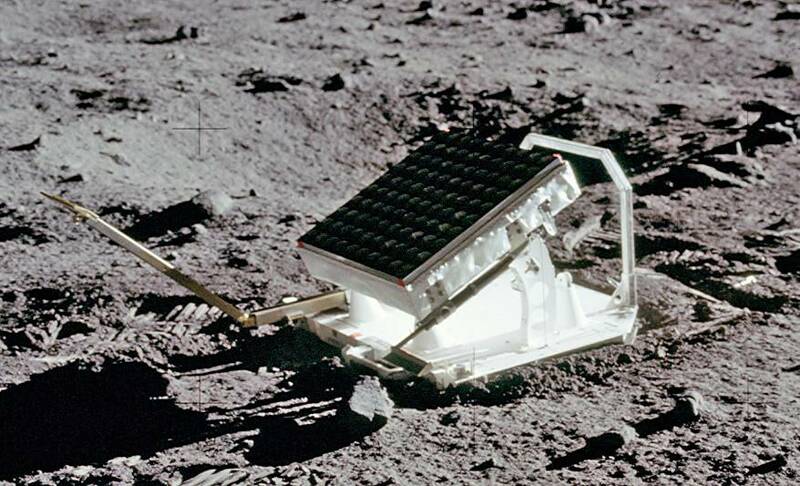 The function of the experiment was to separate and measure high-energy radiation damage to the solar cells, to measure reduced solar cell output due to dust accumulation, and to measure reflected infrared energy and temperatures for use in computing lunar surface temperatures. 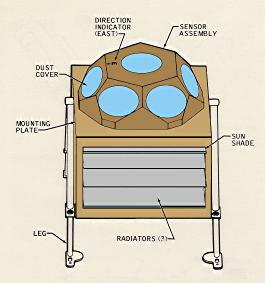 The Dust Detector had two components  a sensor package mounted to the top of the Central Station sun shield, and a printed circuit board located within the Central Station that interfaced with the power distribution unit of the ALSEP data subsystem. Lunar and Solar Wind Experiments. Commonly called the Solar Wind, matter is ejected continuously from the Sun and spreads throughout the Solar System. The energy, density, direction of travel, and its variations were measured by the SWS. 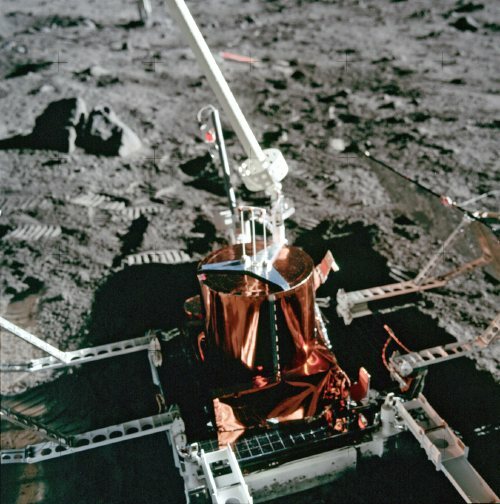 Seven sensors were located under dust shields, allowing a study of the solar wind at the lunar surface, the general properties of the solar wind and its interaction with the Moon. The solar wind stretches the Earths magnetic field out behind the Earth, beyond the Moons orbit, so the SWS also studied the Earths magnetic tail when the Moon passed through it. The Apollo 12 SWS surprised the scientists by continuing to send data after the Sun had set. Dr Conway Snyder of JPL said, The spectrometer didnt quit sending data  it continued to send back information on protons and even photo electrons several minutes after the Sun had stopped shining on it. He suspected the protons were sneaking around the edge of the Moon. The SWS found the solar wind behaved the same as in free space outside the Earths magnetic tail and is slightly disturbed in the geomagnetic transition region. The surprise was the detection of a gas cloud from the Apollo 13 Saturn-IV impact. Cold Cathode Ion Gauge (CCIG). 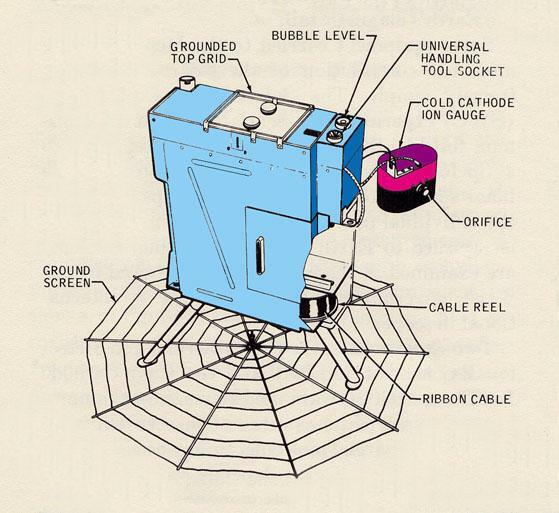 Two experiments, the Suprathermal Ion Detector Experiment (SIDE) and the Cold Cathode Ion Gauge (CCIG) were used to measure the number and types of ions (an electrically charged molecule, either positive or negative) on the Moon. These ions are chiefly hydrogen and helium and are largely derived from the solar wind. The SIDE was used to measure the flux, number, density, velocity, and relative energy of the positive ions near the lunar surface. The CCIG was used to measure the pressure of the lunar atmosphere. It operates at pressures of 10-6 to 10-12 torr. For a comparison the Earths atmosphere at sea level is 760 torr. The pressure measured by the Apollo 14 CCIG on the lunar surface was 10-12 torr. It is interesting to note the astronauts continually released gas molecules, mainly water and carbon dioxide, from their space suits and this was happily measured by the CCIG from astronauts in the immediate vicinity. 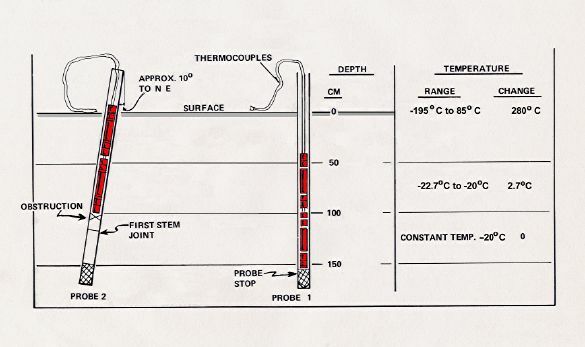 Suprathermal Ion Detector  SIDE (in blue) and Cold Cathode Ion Gauge  CCIG (in red). The SIDE which was part of the ALSEPs on the Apollo 12, 14, and 15 missions had sensors which were directional, pointing in the ecliptic plane 15 degrees from the lunar local meridian. Due to the range of longitudes of the three mission landing sites, the look directions of the instruments were about 38 degrees west, 2 degrees west, and 19 degrees east of the Earth for Apollo 12, 14, and 15, respectively. Thus at certain times during the lunar orbit they could see ion flows in the magnetosheath, but never looked directly at the solar wind. During other times the detectors saw ion events of several different types; some appear to be mainly related to the moon and others to the magnetotail. These instruments resulted in numerous publications and theses. The data had been used to determine the potential of the lunar surface, to determine the effective plasma screening length at the surface, to study the ion mass spectra, and to study magnetotail ion fluxes. 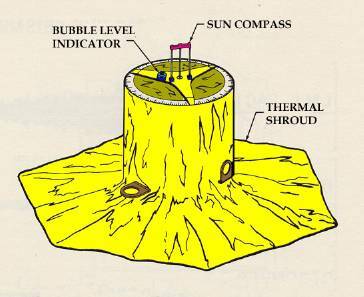 Not a part of the ALSEP equipment, the Solar Wind Composition Experiment (SWC) was used to determine the elemental and isotopic composition of the noble gasses in the solar wind. It was a simple experiment that used a sheet of 0.5 mm thick aluminium foil to trap individual particles of the solar wind to a depth of several hundred atomic layers, but allowed cosmic rays to pass through. The astronauts put the screens out on arrival and brought the foil back to Earth for analysis by Swiss scientists. University of Sydney, Dr Brian OBrian, principal investigator. Only used on the Apollo 14 ALSEP, this experiment measured the particle energies of solar protons and electrons that reach the lunar surface. It provided data on the energy distribution of these solar particles and their effect on the Earth/Moon system, as well as the relationship of the solar wind to Earth auroras; the Van Allen radiation belt; processes taking place at the shock front of the solar wind striking the lunar surface; characteristics of the earths magnetic field; and the effect of charged particles on the lunar environment. It measured protons and electrons in the energy range of 40,000 to 70,000 electron volts (40 to 70 Kev) and consisted of 2 spectrometer packages oriented for minimum exposure to the Suns ecliptic path. Each spectrometer had 6 particle detectors  5 C-shaped channeltron photon multipliers consisting of glass capilliary tubes of 1 millimetre diameter, 10 centimetres long; and 1 helical funneltron photon-multiplier with an 8 millimetre opening. Particles of a given charge and different energies entering the spectrometer were subject to varying voltages and deflected toward the five photon-multipliers, while particles of the opposite charge were deflected to the funneltron photon-multiplier. Electrons and photons were thus measured simultaneously at five different energy levels. 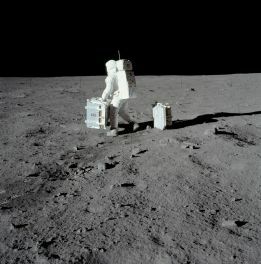 The CPLEE was deployed 3 metres north east of Apollo 14s central station. Results showed there are low energy photo-electrons during the day, with large changes in the solar wind flux. The unexpected was the detection of electrons with terrestrial aurorae band energies in the Earths magnetospheric tail. Only used on Apollo 17 ALSEP, the LSGs major goal was to confirm the existence of gravity waves as predicted by Einstein; to measure the response of the Moon to the Earths tidal pull; and to detect free lunar oscillations in periods of 15 minutes or longer. It could also measure vertical components of seismic events with frequencies up to 16 cycles per second, thus supplementing the passive seismic network of Apollo 12, 14, 15 and 16 missions. This instrument was designed to make very accurate (1 part in 10^11) measurements of the lunar gravity and of its variation with time. It was essentially a sensitive spring balance, and also functioned as a one-axis seismometer. Its intent was to measure gravity waves by using the Moon as an antenna and also investigate tidal distortions of the shape of the Moon. 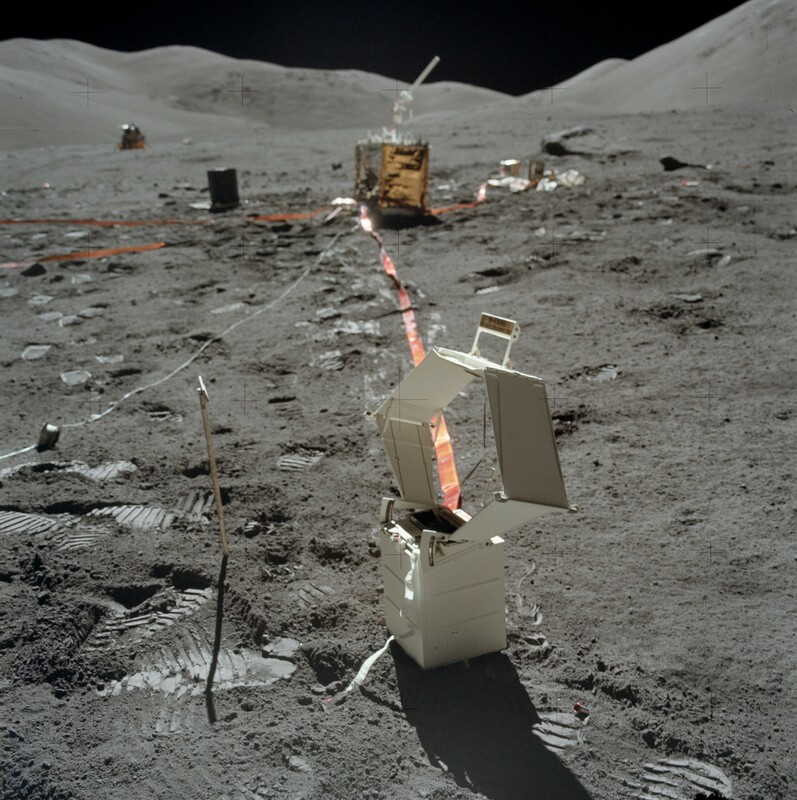 Following deployment of the gravimeter during Apollo 17, problems occurred in trying to balance the beam. These problems were caused by a mathematical error in the sensor mass weights. Several reconfigurations of the instrument had been made during the previous year. It was discovered on EVA 2 that the sensor beam of the LSG could not be nulled (using the micrometer screw adjustment of the instrument), even though Harrison Schmitt re-verified that the instrument was level and the gimbal was free. Later analysis showed a design (arithmetic) error of the sensor mass weights. They were approximately 2% lighter than the proper nominal weight for one sixth g operation of the flight unit. The sensor mechanism allowed up to only 1.5% adjustment from the nominal for possible inaccuracies. The error was made in the conversion calculations from 1 g to 1/6 g for the flight unit by including an erroneous value in the calculations from the uncorrected calculations for the qualification unit. The Lunar Surface Gravimeter in the foreground, and other ALSEP components in the background. Note the LM in the distance. Repairs were attempted on EVA 2 and 3, but were unsuccessful due. Schmitt rapped the exposed top plate on the gimbal; rocked the experiment in all directions; re-levelled the instrument, working the base well against the surface; and verified the sunshade tilt. These actions were taken to free a mass assembly or a sensor beam that was suspected of being caught or bound, but no change was apparent. The problem was at least partly overcome by applying pressure on the beam with the mass-changing mechanism beyond the design point by addition of all included masses so that it contacted the beam. Much valuable EVA time (about 30 minutes) was spent on the attempt. The Lunar Ejecta and Meteorites Experiment was used on Apollo 17 to study the frequency and nature of small particles striking the Moon, and the effect of the ejecta they fling out. It contained three sensor plates oriented in different directions, allowing it to measure the velocity and direction of motion of impacting particles. It was expected that this experiment would detect both particles arriving from external sources, such as cometary debris and interstellar grains, as well as particles ejected from the Moon by other impacts. However, analysis of the results indicated that it primarily detected fine lunar dust grains being transported at slow speeds across the lunar surface. The Lunar Ejecta and Meteorites Experiment. The Moon does have an atmosphere, but it is very tenuous. Gases in the lunar atmosphere are easily lost to space. Because of the Moons low gravity, light atoms such as helium receive enough energy from solar heating so that they escape in just a few hours. Heavier atoms take longer to escape, but are ultimately ionised by the Suns ultraviolet radiation, after which they are carried away from the Moon by the solar wind. This process takes a few months. Because of the rate at which atoms escape from the lunar atmosphere, there must be a continuous source of particles to maintain even a tenuous atmosphere. Sources for the lunar atmosphere include capture of particles from the solar wind and of material released from the impact of comets and meteorites. For some atoms, particularly helium-4 and argon-40, out gassing from the Moons interior may also be a source. The Lunar Atmospheric Composition Experiment was used on Apollo 17. It was a mass spectrometer that measured the composition of the lunar atmosphere. On earlier missions, only the total abundance of the lunar atmosphere was measured by the Cold Cathode Gauge. The three primary gases in the lunar atmosphere are neon, helium, and hydrogen, in roughly equal amounts. Small amounts of methane, carbon dioxide, ammonia, and water were also detected. In addition, argon-40 was detected, and its abundance increased at times of high seismic activity. Argon-40 is produced by the radioactive decay of potassium-40 in the lunar interior, and the seismic activity may have allowed escape of argon from the interior to the surface along newly created fractures. This experiment is similar in principle to the previous ALSEP seismometers, but very different in design. It consists of a seismic data gathering network of 4 geophones, placed in the centre and at each corner of a 90metre equilateral triangle. Explosive charges on the surface generated seismic waves of varying strengths to provide a structural profile of the Apollo 17 site. The triangular arrangement of the geophones allowed measurement of the azimuths and velocities of the seismic waves more accurately than the Active Seismic Experiments on Apollo 14 and 16. After the charges were detonated by ground command the experiment became a Passive Seismometer. In addition to the ALSEPs LSM, a portable Magnetometer (LPM) was taken on Apollo 14 and 16. Its purpose was different. It was carried with the astronauts on the traverses and used to measure the Moons magnetic field at several different spots. This technique of measuring the magnetic field as a function of distance is a standard one on Earth and is used extensively in prospecting. Many ore bodies cause anomalies in the Earths magnetic field. Thus, if at a particular place we expect the magnetic field to be 40,000 nT and it is 36,000 nT, then the anomaly is 4,000 nT. On the Earth, anomalies of several thousand nanoteslas are common. Not so on the Moon. The total magnetic field of the Earth is about 50,000 nT. Because the Moons magnetic field is only about one-thousandth that of the Earths field, the magnetic anomalies are much smaller. The range of the Portable Instrument is 256 nT. An LPM was carried on the Apollo 14 mission. Unfortunately only two measurements were obtained then. Both were startling. The first, taken near the landing point (but out of the LMs magnetic field) was about 43 nT. The second was taken on Cone Crater. It was 103 nT. These values were startling for two reasons. First, they were much larger than expected beforehand. Previous satellite measurements had obtained an unequivocal indication that the average value for the magnetic field at the surface of the Moon could not be larger than 10 to 12nT. Yet these values were much larger. The difference in the two values, 60 nT, was equally startling. Such large changes had not been expected to occur over a short distance. In order to help understand the rapid change with distance, several measurements were taken on Apollo 16. These changes with distance are almost surely caused by the natural magnetization of the lunar rocks. Natural magnetization has been known in terrestrial rocks for many years. The term lodestone is the name used for a naturally occurring magnet. The material of lodestone is magnetite, a strongly magnetic mineral. There are, of course, other magnetic minerals but magnetite is the most common. It also occurs in lunar rocks. The sensors were contained in a box mounted on a tripod. They were connected to an electronics box on the Rover by a 15.2 metre flat ribbon electrical cable. In use, the tripod was set about 15 metres from the Rover. It had to be oriented with the shadow of the Sun and levelled. 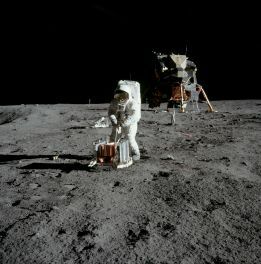 The astronaut then returned to the Rover to read the instrument. There were three digital panel meters resembling digital clocks, one for each axis. These meters indicated the size of the three components of the Moons magnetic field. The astronaut reported the readings over the voice communications link with Earth. The tripod had to be erected a good distance from the Rover because of the inherent magnetism of the vehicle and the astronaut. So for the actual measurement, the sensors were set away from both the astronaut and the Rover. This experiment was performed on Apollo 17 to measure variations of the gravitational acceleration in the vicinity of the Taurus-Littrow landing site. 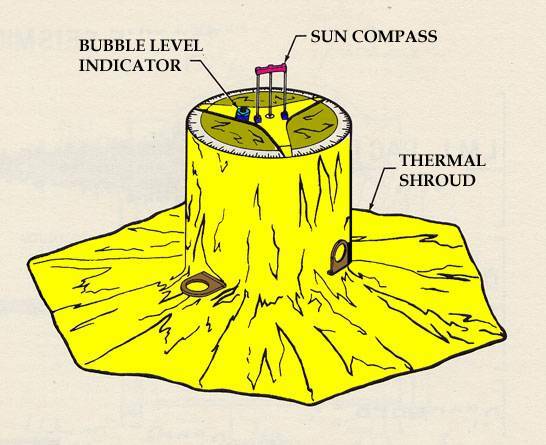 The purpose of the experiment was to obtain information about the sub-surface structure at the landing site. Gravity measurements were made at 12 of the traverse stops on the three EVAs, and the results were read back to Earth by the crew. Interpretation of these observations also required knowledge of the topography of the landing site, which was obtained from analysis of stereo photography taken from lunar orbit. The results of this experiment indicated that the mare basalt layer in the vicinity of the landing site has a thickness of 1 kilometre. This value is slightly less than the 1.4 kilometres measured by the Lunar Seismic Profiling Experiment. Cosmic rays are just particles that have extremely large energies and very high velocities. Their velocity is almost, but not quite, the speed of light. They are mostly protons and alpha particles. But 1 to 2% of the cosmic rays consist of the nuclei (that is, atoms with one or more electrons removed) of heavier elements. The cosmic rays seem to arrive from all directions and, although their origin is not yet known with certainty, they come from outside our solar system. In addition to cosmic rays, the CRD equipment detected low energy solar wind particles. The range of energy of the particles is very great, but some have very low energy. One purpose of the CRD experiment was to investigate the low-energy particles. Another purpose was to investigate neutrons from the lunar surface. In the CRD experiment actual records of the particles was obtained. The collector was a four panel array. Panel 1 was a sandwich of 31 sheets of 0.025 centimetres Lexan, covered by perforated aluminiumised Teflon. Plate 2 was similar to Plate 1 except for Plate 3 was four layers of 0.2 centimetre thick Kodacel cellulose triacetate sheets, overlaid on the upper half by ten 5 micron thick Lexan sheets. Plates of several special materials (some resemble plexiglass) are carried on the outside of the LM to the Moon and then brought back to Earth. The passage of particles through the material is recorded in the form of tiny tracks. The characteristics of these tracks, seen through a microscope, tell us the kind of particle and, of course, its direction of travel. Some of the interest in this experiment is due to the possibility that new elements could have been discovered! The lunar regolith, or the uppermost few metres of the Moon, consists of soil and highly fragmented rocks formed by repeated impacts of meteoroids with the Moons surface. These impacts eject material from the craters that are formed, and the ejecta are usually deposited nearby. The overall effect of many such impacts is a continual overturn of the regolith, which keeps it well mixed. This can be thought of as a sort of gardening, analogous to the mixing of soil performed by a farmers plough. The NPE was performed on Apollo 17 to determine the rate at which the lunar regolith is overturned or mixed. It consisted of a 2.4 metre long rod with several detectors that was inserted into the hole left from drilling a deep core sample. These detectors measured the number of neutrons penetrating to different depths in the regolith. The Neutron Probe was deployed on the first EVA and retrieved at the end of the third EVA after being exposed to the lunar regolith for 49 hours. It was then returned to Earth for analysis. When cosmic-ray protons strike the lunar surface, nuclear reactions between the protons and atoms in the soil sometimes create neutrons, which may penetrate a short distance into the regolith. These neutrons are ultimately absorbed by other atoms, and the resulting nuclear reactions sometimes lead to the formation of radioactive isotopes, which later break down to form more stable isotopes. These radioactive isotopes provide a way to measure the rate at which the regolith is mixed. Because neutrons only penetrate a short distance into the regolith, finding radioactive elements at deeper depths means that material has been mixed to that depth in less time than it takes for the radioactive isotopes to break down. Measuring the regoliths mixing rate requires knowing three things: (1) the current abundance of radioactive elements, which is measured in core samples returned by the astronauts to Earth; (2) the rate at which radioactive elements decay, which is known from laboratory studies on Earth; and (3) the rate at which radioactive elements are created by neutron bombardment, which was determined from Lunar Neutron Probe data. The degree of mixing in the regolith depends on the size of an impacting body, with larger impacts mixing material to greater depths. Small impacts are much more common than larger impacts, and so mixing to small depths occurs more often than mixing to large depths. Current estimates are that mixing to a depth of 1 centimetre occurs on average every million years, while mixing to a depth of 1 metre occurs only about once every billion years. These estimates are based on measurements of radioactive element abundances in lunar core tubes as well as on a variety of other chemical measurements of these cores. This lunar neutron probe was designed to measure the rates of low-energy neutron capture as a function of depth in the lunar regolith. 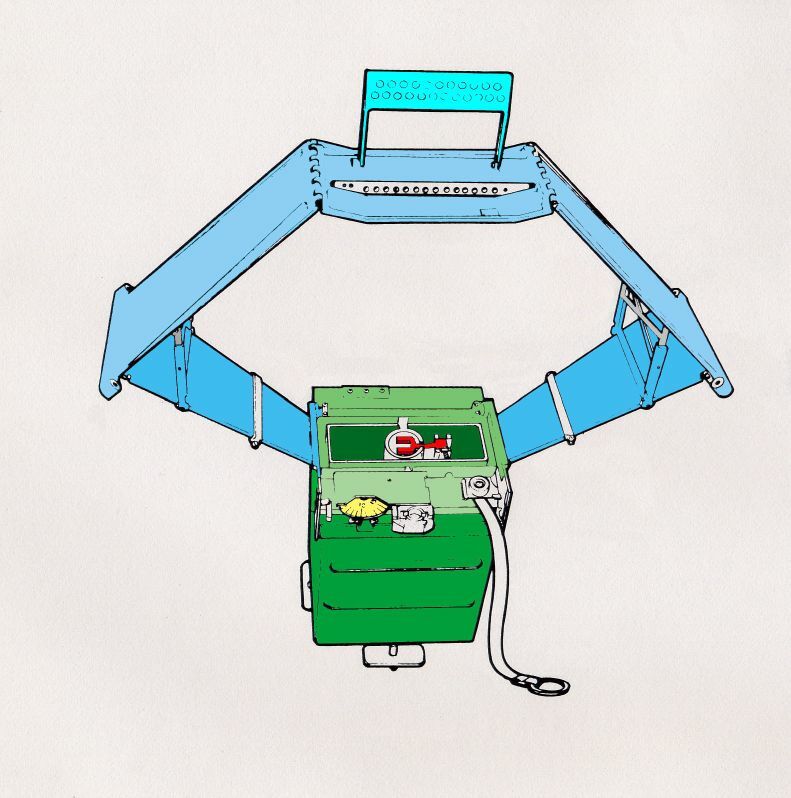 The experiment made use of two particle track detection systems. A cellulose triacetate plastic detector was used in conjunction with Boron 10 targets to record the alpha particles emitted with the neutron capture on Boron 10. The second system used mica detectors to detect the fission fragments from neutron-induced fission in uranium 235 targets. 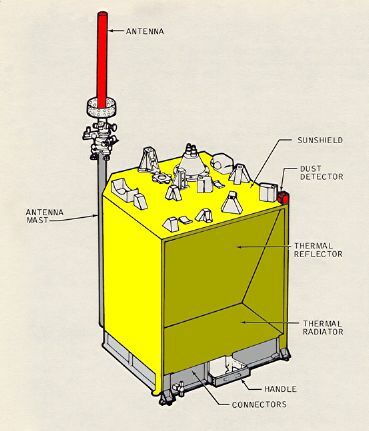 The neutron probe had the form of a rod which yielded an essentially continuous record of the neutron capture rate from the lunar surface down to a depth of over 2 metres. The probe was activated and deactivated by a rotational motion which brought the target and detector system in and out of alignment. An on-off mechanism was necessary to prevent accumulation of background events produced in flight by neutrons from the ALSEP power generator and from cosmic ray neutrons produced in the spacecraft. 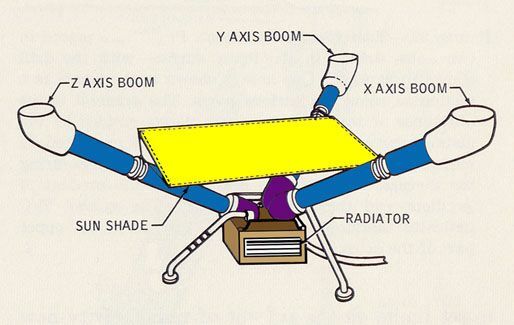 Point sources of uranium 238 were included at three positions along the probe to provide fiducial marks to verify that the probe was properly activated. In addition, cadmium absorbers were included in the centre and bottom of the probe to obtain a neutron energy spectrum with a threshold of 0.35 eV. Further spectral information was obtained from analyses of krypton 80 and krypton 82 produced by bromide neutron capture in potassium bromide contained in evacuated capsules which were inserted at the top, middle, and bottom of the probe. The experiment performed normally from acitvation on 12 December 1972 to termination at the end of the third EVA on 13 December 1972. Massachusetts Institute of Technology, Cambridge. This experiment consisted of a transmitting antenna deployed near the lunar module and a receiving antenna on the Rover. At several different traverse stops, electrical signals were transmitted through the regolith and recorded on the Rover. Comparison of the transmitted and received signals allowed the electrical properties of the regolith to be determined. This information was intended to provide ground truth for the analysis of orbital observations by the Bistatic Radar and Lunar Sounder Experiments. In addition, the results of this experiment showed that the upper 2 kilometres of the lunar surface are extremely dry, which is consistent with measurements of lunar rock composition. The purpose of the SEP experiment was to obtain data about the electromagnetic energy transmission, absorption, and reflection characteristics of the lunar surface and subsurface for use in the development of a geological model of the upper layers of the moon. This experiment determined layering, searched for pressure of water below the surface, and measured electrical properties in situ, determining these as a function of depth. The selected frequency range was chosen to measure these properties in a range from a few metres to a few kilometres depth. The transmitter produced continuous waves at 1, 2.4, 4, 8.1, 16, and 32.1 MHz, successively. These waves permitted measurement of the size and number of scattered bodies in the subsurface. Any moisture present was easily detected because minute amounts of water in rocks or subsoil change the electrical conductivity by several orders of magnitude. The equipment for this experiment consisted of a deployable self-contained transmitter, a multiple frequency transmitter antenna, a portable receiver/recorder on the Rover, a wide-bandwidth mutually orthogonal receiver antenna, and a retrievable data recording device. The crew transported and set up the transmitter approximately 100 metres from the LM and then deployed the antennas. The receiver/recorder was placed on the LM. The crew established the location of the Rover in relation to the transmitter for each data stop during the traverse. Wheel turns were counted for distance, and azimuth was recorded using the navigation system. The recorder was then returned to Earth. Downlink Frequency : 2278.5 MHz. The central station, located at 3.00942 S Latitude 23.42458 W longtitude, was turned on at 0021 AEST on 20 November 1969 and off on 30 September 1977. A Cold Cathode Ion Gauge (CCIG). A Lunar Surface Magnetometer (LSM) (commanded OFF on 14 June 1974). A Solar Wind Spectrometer (SWS). A Suprathermal Ion Detector (SIDE). Apollo 12 had a Solar Wind Composition Experiment (SWC) exposed for 18 hours 42 minutes. Downlink Frequency : 2279.5 MHz. The central station, located at 3.64398 S latitude, 17.47748 W longitude, was turned on at 0423 AEDT on 6 February 1971 and failed during January 1976. Apollo 14 had a Solar Wind Composition Experiment (SWC) exposed for 21 hours, and a Laser Ranging Retro-reflector (LRRR). There was also a Portable Magnetometer (LPM) carried on the MET. The central station, located at 26.13407 N latitude, 3.62981 E longitude, was turned on at 0437 AEST on 1 August 1971 and shut down on 30 September 1977. A Passive Seismic Experiment (PSE). A Heat Flow Experiment (HFE). 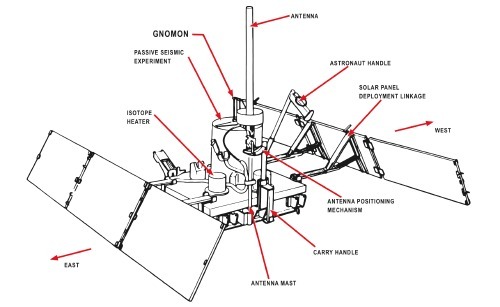 A Lunar Surface Magnetometer Experiment (LSM) (Commanded OFF on 14 June 1974). Laser Ranging Retro-reflector (LRRR) with 300 fused silica cubes. Downlink Frequency : 2276.0 MHz. The central station, located at 8.97537 S latitude, 15.49812 E longitude, was turned on at 0538 AEST on 22 April 1972 and shut down along with the other ALSEP stations on 30 September 1977. An Active Seismic Experiment (ASE). A Surface Magnetometer Experiment (LSM). Apollo 16 had a Solar Wind Composition Experiment (SWC) exposed for 45 hours 5 minutes. It also carried a Portable Magnetometer (LPM) and a Cosmic Ray Detector (CRD). The central station, located at 20.19209 N latitude, 30.76492 E longitude, was turned on at 1253 AEST on 12 December 1972 and shut down along with the other ALSEP stations on 30 September 1977. A Lunar Seismic Profiling Experiment (LSPE). A Lunar Atmospheric Composition Experiment (LACE). A Lunar Ejecta and Meteorite Experiment (LEAM). 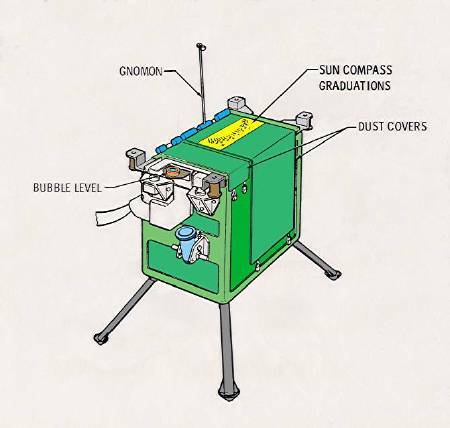 A Lunar Surface Gravimeter Experiment (LSG). Lunar Surface Electrical Properties (SEP). POST APOLLO LUNAR PROGRAMS OFFICE ESTABLISHED. On 15 March 1973 a Post-Apollo Lunar Programs Office was established, under which the Lunar Data Analysis and Synthesis Program would be conducted, was established in the Office of Space Science at NASA Headquarters. The office was responsible for continued operation and collection of data from the ALSEP and the P&F sub-satellites; Apollo surface and orbital science data analysis by principal investigators; development of selenodetic, cartographic, and photographic products; continued lunar laser ranging experiment; continued lunar sample analysis; lunar supporting research and technology; and advanced program studies. When funding for the technical and scientific support ran out, all five ALSEP stations were officially shut down on 30 September 1977, after more than 153,000 commands were transmitted to them, and more than one trillion bits of science data were received on Earth. Although the experiments were turned off, the transmitters continued to send carrier signals which were used by various institutions, including the Jet Propulsion Laboratory, for geodetic and astrometric studies, and spacecraft navigation. After four years of sending a steady flow of data, the Apollo 14 ALSEP developed an intermittent fault. It had worked steadily for four years, then began an intermittent on and off cycle for its last two years, due to a short circuit in one of the power conditioning units. It seemed related to the temperature of the unit, reacting to the position of the Sun over the site. The ALSEP program cost NASA $US200 million, including the design and development of the stations and experiments, support engineering work in Houston, and the analysis of the data by dozens of University laboratories around the world. It cost NASA $US2 million a year to operate. Top Ten Scientific Discoveries Made During Apollo Exploration of the Moon. From the Johnson Space Center, Houston. The Moon is not a primordial object; it is an evolved terrestrial planet with internal zoning similar to that of Earth. Before Apollo, the state of the Moon was a subject of almost unlimited speculation. We now know that the Moon is made of rocky material that has been variously melted, erupted through volcanoes, and crushed by meteorite impacts. The Moon possesses a thick crust (60 kilometres), a fairly uniform lithosphere (60-1000 kilometres), and a partly liquid asthenosphere (1000-1740 kilometres); a small iron core at the bottom of the asthenosphere is possible but unconfirmed. Some rocks give hints for ancient magnetic fields although no planetary field exists today. The Moon is ancient and still preserves an early history (the first billion years) that must be common to all terrestrial planets. The extensive record of meteorite craters on the Moon, when calibrated using absolute ages of rock samples, provides a key for unravelling time scales for the geologic evolution of Mercury, Venus, and Mars based on their individual crater records. Photogeologic interpretation of other planets is based largely on lessons learned from the Moon. Before Apollo, however, the origin of lunar impact craters was not fully understood and the origin of similar craters on Earth was highly debated. The youngest Moon rocks are virtually as old as the oldest Earth rocks. The earliest processes and events that probably affected both planetary bodies can now only be found on the Moon. Moon rock ages range from about 3.2 billion years in the maria (dark, low basins) to nearly 4.6 billion years in the terrae (light, rugged highlands). Active geologic forces, including plate tectonics and erosion, continuously repave the oldest surfaces on Earth whereas old surfaces persist with little disturbance on the Moon. The Moon and Earth are genetically related and formed from different proportions of a common reservoir of materials. The distinctively similar oxygen isotopic compositions of Moon rocks and Earth rocks clearly show common ancestry. Relative to Earth, however, the Moon was highly depleted in iron and in volatile elements that are needed to form atmospheric gases and water. The Moon is lifeless; it contains no living organisms, fossils, or native organic compounds. 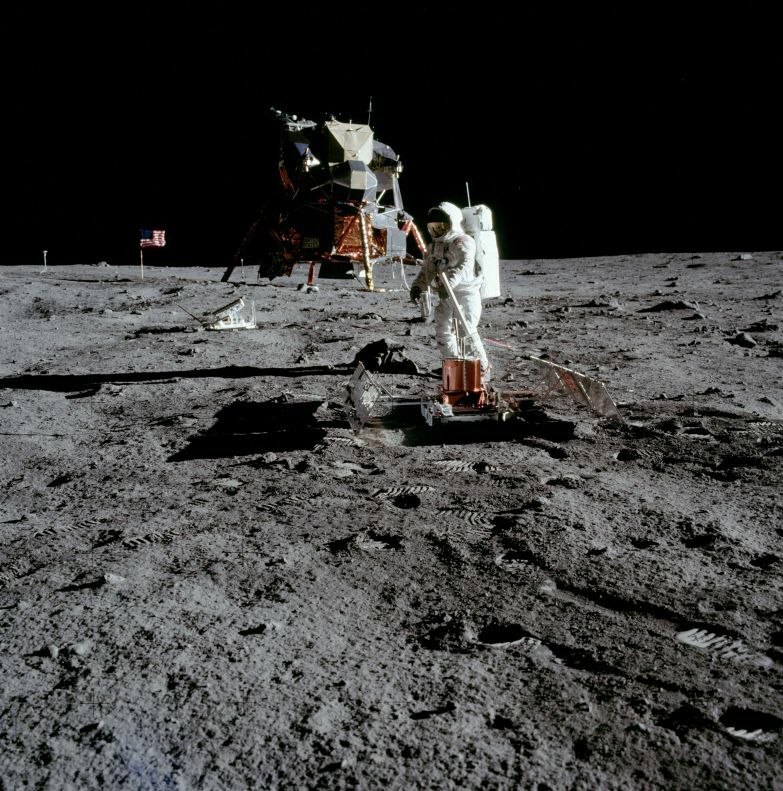 Extensive testing revealed no evidence for life, past or present, among the lunar samples. Even non-biological organic compounds are amazingly absent; traces can be attributed to contamination by meteorites. All Moon rocks originated through high-temperature processes with little or no involvement with water. They are roughly divisible into three types: basalts, anorthosites, and breccias. Basalts are dark lava rocks that fill mare basins; they generally resemble, but are much older than, lavas that comprise the oceanic crust of Earth. Anorthosites are light rocks that form the ancient highlands; they generally resemble, but are much older than, the most ancient rocks on Earth. Breccia are composite rocks formed from all other rock types through crushing, mixing, and sintering during meteorite impacts. The Moon has no sandstones, shales, or limestones such as those that testify to the importance of water-borne processes on Earth. Early in its history, the Moon was melted to great depths to form a magma ocean. The lunar highlands contain the remnants of early, low-density rocks that floated to the surface of the magma ocean. The lunar highlands were formed about 4.4  4.6 billion years ago by flotation of an early, feldspar-rich crust on a magma ocean that covered the Moon to a depth of many tens of kilometers or more. Innumerable meteorite impacts through geologic time reduced much of the ancient crust to arcuate mountain ranges between basins. The lunar magma ocean was followed by a series of huge asteroid impacts that created basins that were later filled by lava flows. The large, dark basins such as Mare Imbrium are gigantic impact craters, formed early in lunar history, that were later filled by lava flows about 3.2  3.9 billion years ago. Lunar volcanism occurred mostly as lava floods that spread horizontally; volcanic fire fountains produced deposits of orange and emerald-green glass beads. The Moon is slightly asymmetrical in bulk form, possibly as a consequence of its evolution under Earths gravitational influence. Its crust is thicker on the farside, while most volcanic basins  and unusual mass concentrations  occur on the nearside. Mass is not distributed uniformly inside the Moon. Large mass concentrations (Mascons) lie beneath the surface of many large lunar basins and probably represent thick accumulations of dense lava. Relative to its geometric centre, the Moons centre of mass is displaced toward Earth by several kilometres. The surface of the Moon is covered by a rubble pile of rock fragments and dust, called the lunar regolith, that contains a unique radiation history of the Sun that is of importance to understanding climate changes on Earth. The regolith was produced by innumerable meteorite impacts through geologic time. Surface rocks and mineral grains are distinctively enriched in chemical elements and isotopes implanted by solar radiation. As such, the Moon has recorded four billion years of the Suns history to a degree of completeness that we are unlikely to find elsewhere. Unless otherwise credited, all photos courtesy NASA.